Which one? I know I was working on a railroad track version, but never finished it. Didn't like the usable space, it seemed more like a humongous fuller to me. The 180'lbr was the one I was thinking of. I know you were still talking about adding Hardy's etc last post but I never did see how it ended up. Nice work Steve... I wish more of my ag cylinders had bushings like that. They tend to wear oblong with extended use. That's a beauty! How do you feel about dressing the edges at this point? Thanks, edges right now are really sharp. I rounded then over just the slightest. Plan to leave it that way until the need arises for more. Last thing I'd want is to radius the edges too much. The 180'lbr was the one I was thinking of. I know you were still talking about adding Hardy's etc last post but I never did see how it ended . Oh yeah, I did several versions of hardy's, the last one worked pretty good, but never stayed very still if I was doing anything other than straight up and down hammering. My main thing was really wanting a horn. I tried three different hardy bickerns, but scenario was the same- too much moving around. 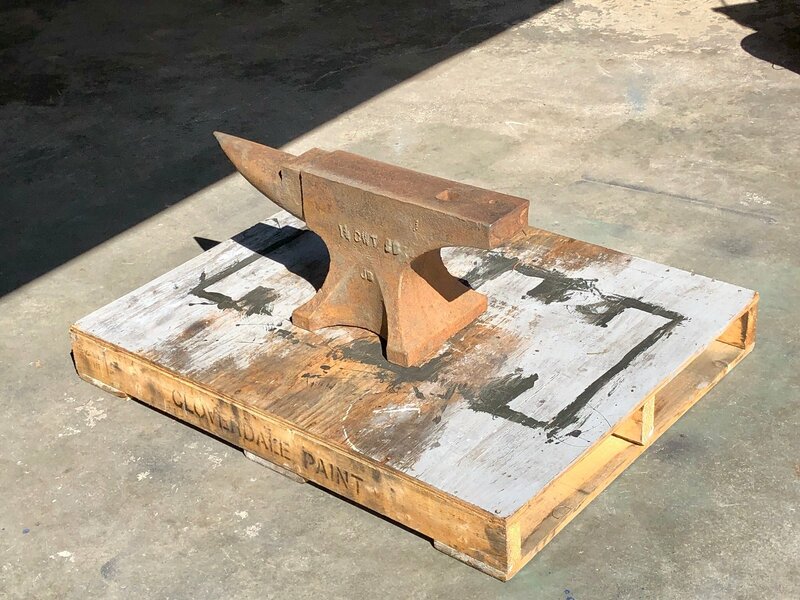 This new anvil is nice, in the sense that everything is super buff, and well supported throughout. The face is also similar in size to my old one. Now I'm just getting used to actually forging on a regular anvil, instead of chunk of steel. This was my previous anvil. it is good to have different radii on different places on the edge; a sharp edge is rarely used for most work, and can lead to cold shuts and stress risers in the work if not careful. I got this 195 pound John Brooks today. Made in England. Nice shape and good ring but ho hum 65 percent rebound. I only had pics to go by, but I only paid $4/lb Canadian or $3.04 USD. I gave the guy $50 for delivering it to my shop as it would have cost me half a day and that much in gas to pick it up myself. since I got my non running forge I have been reading in here. Im trying to understand the power hammer build if your using air why have the spring? The spring acts as the helve, transferring power from the cylinder to the tup or ram; a spring buffers the action to mitigate shock loading and also adds some whip at higher hit rates. I wouldn't worry about the rebound too much; I often think folks make more of that than needs be. 65% is going to make for a fine performer, and hopefully with edges that'll be soft enough to not chip should there be an errant hammer blow! Or, you can just send it my way. I'll pay you $50 to help cover your gas and time! 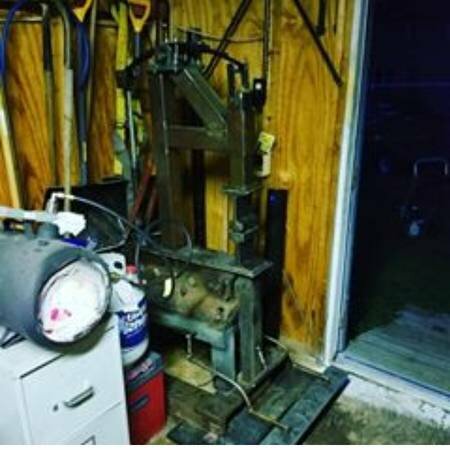 I found this power hammer on Craigslist for $1,000 or best offer and was initially excited. The first pic is the only one that was in the ad. After receiving the other pics, I am having second thoughts. The seller says I cant get it until Saturday so there is time for me think about it. I know I could build one, it is more a matter of wondering whether this is a good deal to jump right into having one. I think you should give it a pass, Pat. That looks like 12 welds, 8 holes, and 150 worth of metal. Unless the switching mechonism is amazing of course. On a power hammer can they be stopped on the down stroke or is it once its fired its going to stroke? seems incredibly dangerous. But I gues just keep clear. I think you'd find a 5-ton fly press far more versatile and efficient than that junkyard hammer. Thanks guys. I saw the first pic on my phone and was a bit excited. Once I saw the other pics on my computer, I had a feeling I should pass. I still have that 5 foot long piece of 8 inch axle I picked up earlier in the year I could use. Between that, already having an electric motor, roller bearings, and a pile of scrap metal, I think I have a decent stack of material to make my own. I would pass on it as well, for the reasons mentioned above, and it also looks like the stroke is on the short side....maybe a little too much junkyard in that hammer. .....maybe a little too much junkyard in that hammer. dang. I wish I’d said that! I have had a couple of hours to work on my blower mount and am wondering about heat on the electric motor. i was going to mount the motor above the fan but now im second guessing myself. 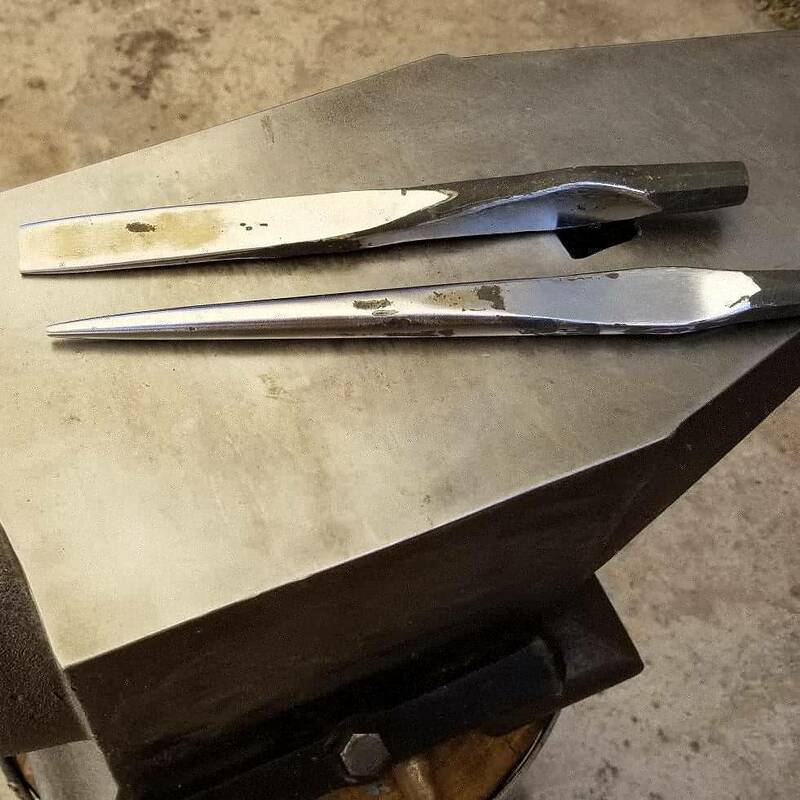 Im planning on having fork pockets under the whole forge so i can move it into and out of the work area. What about mounting the motor behind the fan that way you can put it on a hinged plate and let the weight of the motor tension the drive belts? I don't think heat is an issue since you're so far away from the pot. Even if you put the motor between the pot and the fan, the heat even 6" from a roaring fire is minimal. Well, maybe not minimal but surely not something that'll damage the windings and whatnot. I'd be tempted to go under the fan, moving the fan up so it's at or above the forge proper. Gravity would be able to help tension, again, but you also keep the overall footprint relatively small. Compared to the guys advocating hair dryers and leaf blowers, that thing should move a lot of air. I assume it will have some sort of waste gate type valve at the base of the forge to control flow? Got a nice vintage look to her. idacal , build a fire resistant skirt under the frame, couple a REAL big motor to that blower and move it “hovercraft” style. This way you won’t need the fork lift pockets. LOL... u want hovercraft service to the island? ?